In a scintillating fusion of heartwrenching vocals, explosive footwork and virtuoso guitar playing, Jaleo return to Britain after three years with their latest new stage show ‘A Compás’, brimming over with the intoxicating rhythms, palpable energy and joie de vivre which has become synonymous with the company. 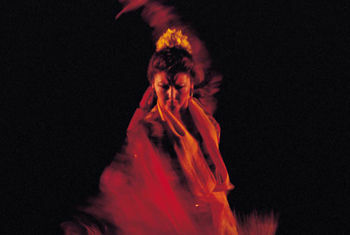 Jaleo Flamenco comes to St George’s Hall Bradford on Wednesday 24 September. ‘A Compás’ (meaning ‘in rhythm’) charts an evocative musical journey through the diverse flamenco regions of Andalusia in which some of Spain´s finest award-winning artists combine their talents in a mesmerising tour de force to produce a unique spectacle of universal appeal which encapsulates the very essence of flamenco. Tickets are available from Bradford Theatres Box Office on 01274 432000, book online here, or read more here.